Welcome to the Northern Gateway Chamber! The Great North Woods is an extraordinary region that is richly diverse and complex. 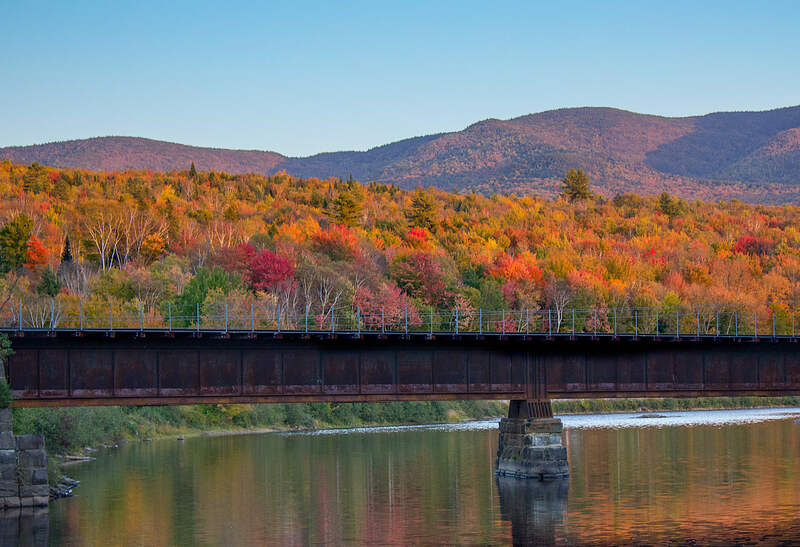 Traveling along the banks of the Connecticut and Ammonoosuc Rivers, one sees a unique blending of history with current economic development. Whether you’re an old friend, a new friend, or considering moving your business to the area, you will find the Northern Gateway Regional Chamber of Commerce (NGRCC) is the premier business advocacy organization in Coos County. Organized in 1958, our Chamber of Commerce focuses its efforts primarily on the ten communities of Lancaster, Whitefield, Dalton, Randolph, Jefferson, Groveton/Northumberland, Stark and Stratford, NH as well as Lunenburg and Guildhall, VT.
We provide members with marketing opportunities, professional development and networking opportunities and so much more. Our office and website make hundreds of referrals each year by providing potential customers and clients with information about your business. A direct benefit of your membership is having the Chamber’s board of directors, committees, and staff working with and for you to make this region a better place in which to do business. The Chamber encourages all members to be involved in events or programs and to provide input on the direction and focus of our activities. If you have any questions about the region or the NGRCC’s program of work, please contact us. We are working hard every day to support the progress of this already fabulous community. Take the Northern Gateway Hiking Challange! The Center has helped the Northern Gateway Chamber of Commerce create a map and brochure to promote its new hiking challenge program, which the Chamber will formally launch at its annual meeting March 21. 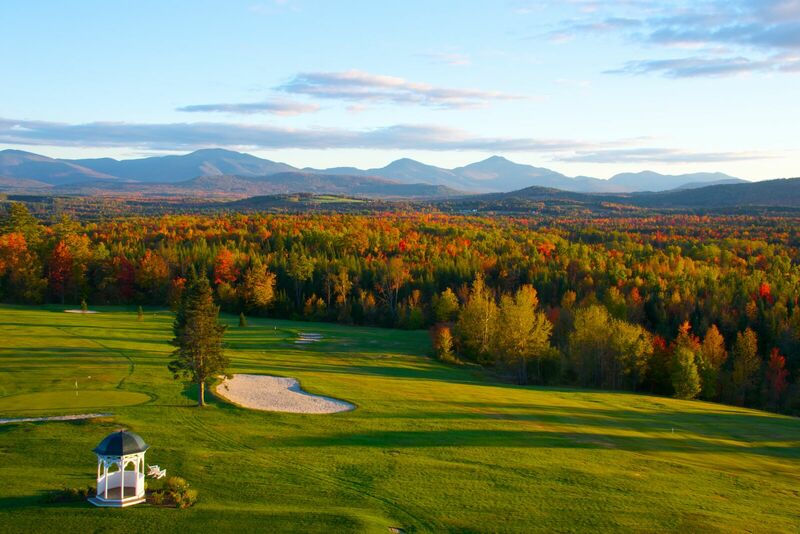 The Northern Gateway Hiking Challenge is a collection of hikes in or near Lancaster, N.H., designed to highlight the town’s special location at the edge of the White Mountains and to encourage outdoor recreation. Download a PDF of the map and brochure. Directions to all the Challenge hikes start from the Great North Woods Welcome Center at 25 Park Street in Lancaster, N.H. Participants can earn an award patch for completing the Challenge by submitting photographs of themselves at the top of each of the peaks. The Chamber will be distributing printed copies of the map and brochure. Earn Your Award Patch It’s easy to earn your Northern Gateway Challenge Hiking patch! Just email us a photo of you and your companions at the peak of each Challenge. We’ll post the photos on social media and on our website. Help us keep track of your progress by naming each photo file you send us with your name, the peak and the date, using this format: “First_Last_Peak_Oct10_2018”. When you send your 5th photo, be sure to include your mailing address and we’ll send you a Northern Gateway Challenge Hiking award patch to wear with pride! We’ll also add your name to the list of people who have successfully completed the Challenge. Please send all email to: northerngatewaychamber@gmail.com. The Center is engaged in several projects to build community vitality in Lancaster, N.H., including redeveloping the historic Parker J. Noyes building and investing in energy efficiency through an energy audit and home improvement program. 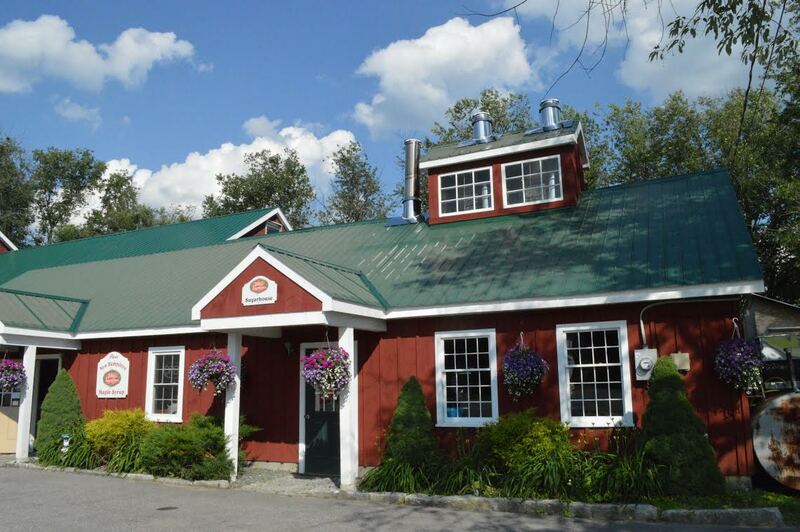 The Northern Gateway Chamber of Commerce serves the 10 communities of Lancaster, Whitefield, Dalton, Randolph, Jefferson, Northumberland, Stark and Stratford, N.H., as well as Lunenburg and Guildhall, Vermont. 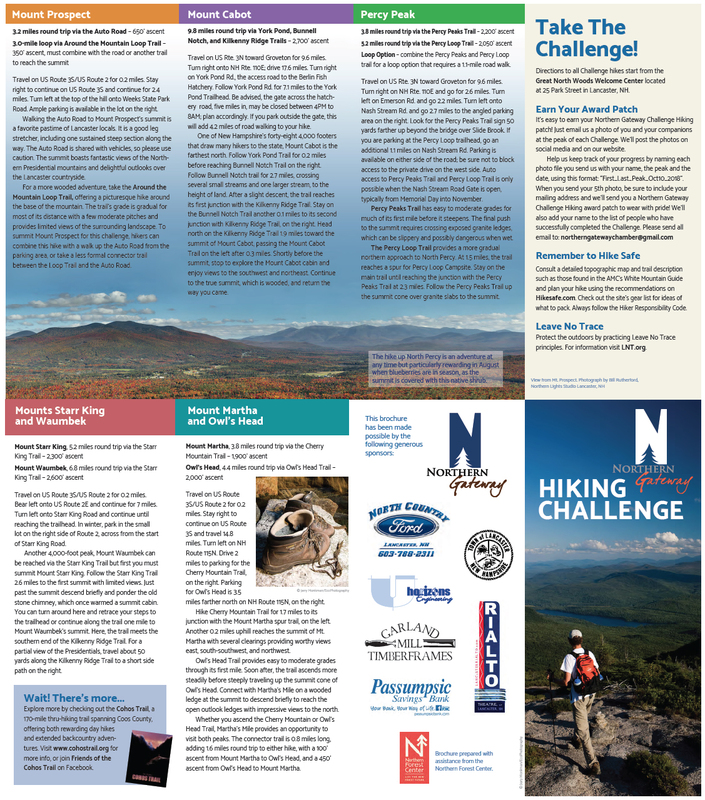 The following sponsored the Northern Gateway Hiking Challenge brochure and map: North Country Ford, Town of Lancaster, Horizons Engineering, Garland Mill Timberframes, The Rialto Theatre and Passumpsic Savings Bank. 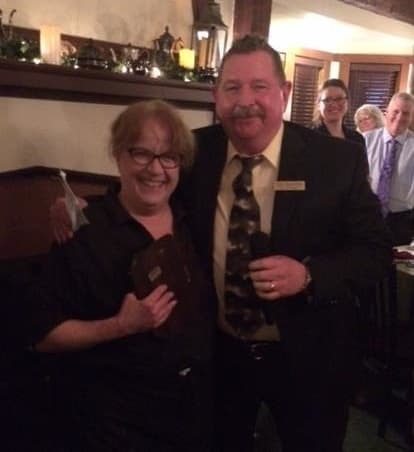 The Chamber's Directors Award recipient Joanne Jacaruso - The Inn at Whitefield for always helping out the entire community! Congratulations to Tammy and Terri Sanborn, Smokin' T's BBQ, Business of the Year. The Directors Award recipient was Joanne Jacaruso owner of the Inn at Whitefield. Join the Chamber on Thursday, April 25 at 6:30 - 9 p.m. for Paint Nite and sipping wine. This month we will be painting on slate. Cost is $35 per person; payment must be received in advance with reservation. Space is limited and reservations are required. 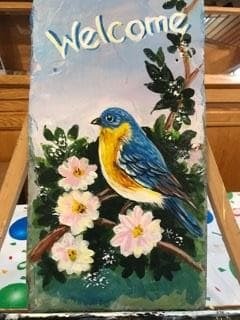 Paint Nite takes place at the Welcome Center in Lancaster located at 25 Park Street. Classes begin promptly. If interested please contact the chamber at northerngatewaychamber@gmail.com or call 603-788-2530.